Although it was almost 75 years ago when on Feb. 19, 1942 President Franklin Roosevelt signed E.O. 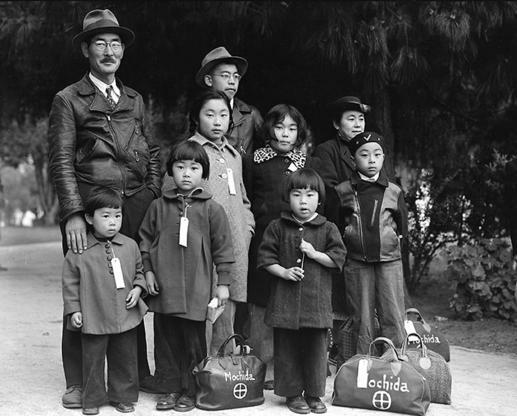 9066, which was neutral on its face, but applied only to rounding up & interning nearly 120,000 Japanese American civilians (2/3 were U.S. Citizens) into relocation camps across America — there is still interest today in the injustice done by these camps and relocation of innocent people. My father Francis Sueo Sugiyama was one of those who fled Los Angeles for Chicago in 1942, before the camp round up. (He had just been expelled from USC’s Dental School due to his race). Coming up Sunday Jan. 22 at the Tucson Desert Art Museum (7000 E. Tanque Verde Rd.) is a talk entitled “Baseball Behind Barbed Wire”. “GAMBATTE! 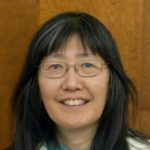 Legacy of an Enduring Spirit” is the first body of work devoted to capturing the past and the present of Executive Order 9066 through photographs and oral histories. Executive Order 9066 was issued by President Franklin D. Roosevelt on February 19, 1942, which led to the imprisonment of nearly 120,000 Japanese Americans during World War II. Through the juxtaposition of historic images and contemporary portraits of the same individuals if their descendants, Kitagaki takes us on a visual exploration of the Japanese concept of Gambatte, or triumph over adversity. 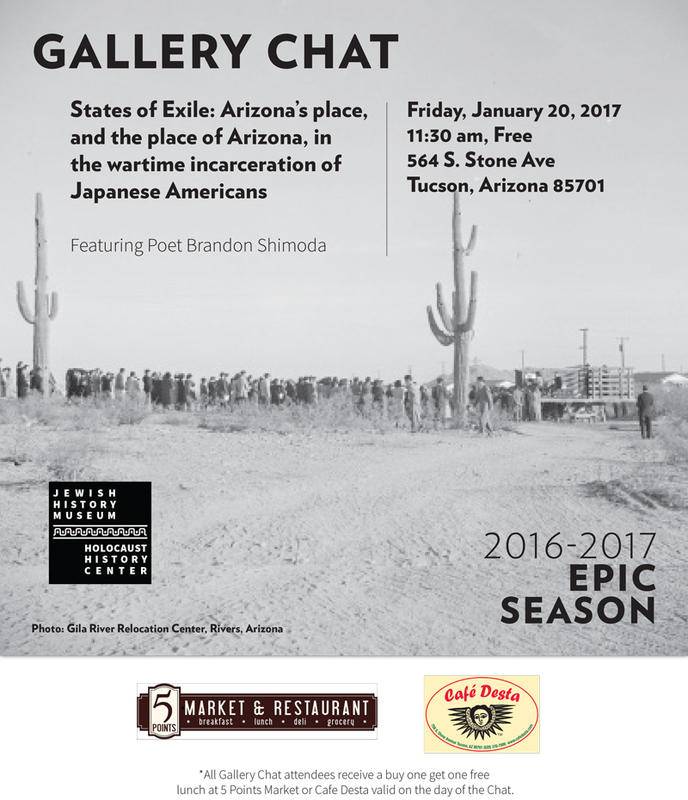 Two companion exhibits at same time/place: “Behind Barbed Wire: Japanese American Incarceration in Arizona”, and “Art of Circumstance: Art & Artifacts Created by Japanese Americans incarcerated during WWII”. Carolyn’s note: Paul Kitagaki’s photos are amazing, as he found the original B/W photos of families being relocated in the 1940’s and in the camps, then photographed these same people decades later. The other 2 exhibits show beautiful watercolors of the camp surroundings, and also artifacts from the internees. Also ongoing up in Chandler, Arizona are exhibits at their Chandler Museum, one on Tule Lake Internment camp (goes to Jan. 27) and another one on the Arizona internment camp at Gila River (opening Feb.7). Please attend these exhibits and talks to find out more about what happened to the Japanese American community during WWII. "Gambatte: Legacy of an Enduring Spirit"
Previous articleMoney matters, maybe it’s just public education that doesn’t? Fascinating story of the baseball teams (32, with 3 Divisions) at Gila River Internment Camp coached by Kenichi Zenimura, a 5 feet 1 inch, 110 lb. baseball star. Before WWII, he had already played in an all-star game in 1927 with Babe Ruth & Lou Gehrig, plus 3 other Nisei. Zenimura’s story is the basis for Bill Staples’ book, who moderated the panel today, with additional panelists from Tucson Badger’s team Will Bailey (pitcher) and Jerry Dodson (catcher). Haiku about baseball was read by author Tets Kurukawa, then the Nisei explained how they built the Gila River baseball diamond, south of the Butte near the camps, out of scrap wood. Official opening of the camp was on 3/7/43 with the Anglo Camp Director making the first pitch for a double header. The Loyalty Oaths Q 27 and Q 28 were discussed, telling about the “No-No” internees who refused to swear loyalty and were sent to Tule Lake, CA camp. A baseball game against Tucson Badgers on 4/18/45 was shown via video from KOLD TV, with a heartstopping game score of 11-10 in the 10th inning, when the interned Gila Butte High team beating the state champs Tucson High Badgers. The players are now in their 90’s that were on this panel, but they remembered the game well. They also had a baseball team reunion in Oct. 2006. Many of the players went on to college baseball, some to prof. ball. Zenimura played professionally in Japan (having been born in Hiroshima, an Issei). Read more in Staples’ book or website, http://www.zenimura.com. Very articulate, moving gallery chat by Brandon Shimoda, whose grandfather was interned in a Dept. of Justice internment camp. Jewish History Museum E.D. Bryan Davis spoke first of the “darkness of human suffering”. Then Brandon spoke of the Jewish History Museum and those murdered during WWII. He then spoke of his so-called “enemy alien” grandfather & other innocent relatives who were taken to Heart Mt. Wyoming and Poston, AZ camps. He also talked about research he had done about Thomas Campbell, who wanted economic gain from useless Arizona land used by the WRA (War Relocation Authority), about dusty Poston camp and the vilification of his family upon return to LA. He mentioned the Gordon Hirabayashi prison camp up on the road to Mt. Lemmon, and Ichiwo Shimoda (not a relative) who was shot in the back near the barbed wire fence at Ft Still, Oklahoma camp. He encouraged museums and shrines that kept history of the “unspeakable” alive and anything that “works against erasure”. Afterwards Founder of SAJCC Ross Iwamoto told the audience about our visit to the Gila River Tribe to see the camp memorial & remnants, and then Ray Akazawa spoke as well, whose family was at Gila River camp. Ray was born after the camps closed. In summary, Brandon said the camps were created due to: “race prejudice, war hysteria, failure of political leadership, and economic exploitation”. And remember this was on U.S. soil, not elsewhere. Valuable information for teachers and interested people! Not sure how well publicized these talks or exhibits are, so just doing my part in informing our readers. Interesting that there is so much going on with this issue now in 2017.